Not sure what to do for dad on Father’s Day, but want to do something special? Here are 5 ways to spoil dad and make it a Father’s Day he will remember. Everyone waits for the day they wake up with breakfast served for them in bed. Make dad’s wishes come true. It’s a special day – let him sleep in, serve him breakfast in bed and let him relax. Dads enjoy a time out, but most will agree that they much rather spend the day with their family. Allow dad to pick where he wants to go and make it a family day out. This could be out for a picnic in the park, to an amusement park or even just going to his favourite restaurant (like The Greek Club) for lunch. Dads often have as much going on as mums do, so its only fair to give dad a break and give him a day off. For some that may mean throwing a football with the kids or playing basketball. For others it may be fishing or reading a book. Whatever he wants to do, just make sure he gets uninterrupted time to do it. If you want to give your dad something really personal this Father’s Day then why not make him a card with a message inside or even frame your favourite photo together. It’s the semimetal presents that we never forget. Is your dad a football fanatic? Is he known for shouting at the television and pretending he’s playing when the game is on? Then why not try and purchase some football tickets so he can see his favourite team? It doesn’t matter if the game isn’t for a while either – it’ll just give him something to look forward to! 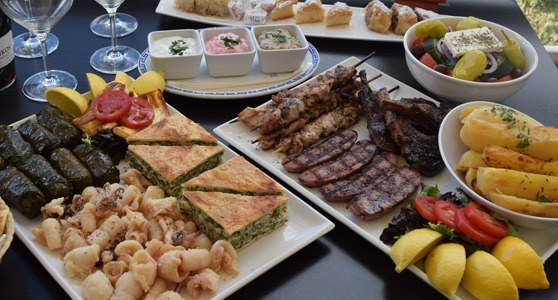 Regardless of what extras you decide to throw in, you can’t go wrong with the Father’s Day Buffet Lunch at The Greek Club’s Odyssey Taverna + Cafe + Bar. With a full traditional Greek buffet, Greek sweets, free carafe of house wine, live acoustic Greek band and city skyline views from our sun-kissed terrace, Dad wont be left disappointed. Call us now on 3844 1166 to book your table, or click here to book online.